My latest lab toy is a Cisco 881G which integrates a cellular 3G interface used a secondary data link. In the following article I will present the existing scenario and what needs to be acomplished. What’s the scenario? We have a small LAN using private IP addresses which need to be translated on both the external links. The primary link is an Ethernet drop so it’s very unlikely to change its state to down so that the router can detect the link failure and make the changes in its RIB. In order to detect a failure on the primary link we have to implement a mechanism which takes an external point as reference and measures different parameters. For instance in my scenario we will send ICMP packets to an external IP address - 8.8.8.8, the Google public DNS server, and measure the RTT. As long as the RTT value is within certain limits the default route will be set on the primary link. If it exceeds that value then the default route set on the primary link will be dropped out of the routing table and a secondary default route - the one from the backup link, which has a higher administrative distance will take its place. We have to make sure that the ICMP packets sent for checking the RTT will be sent only from the primary link. 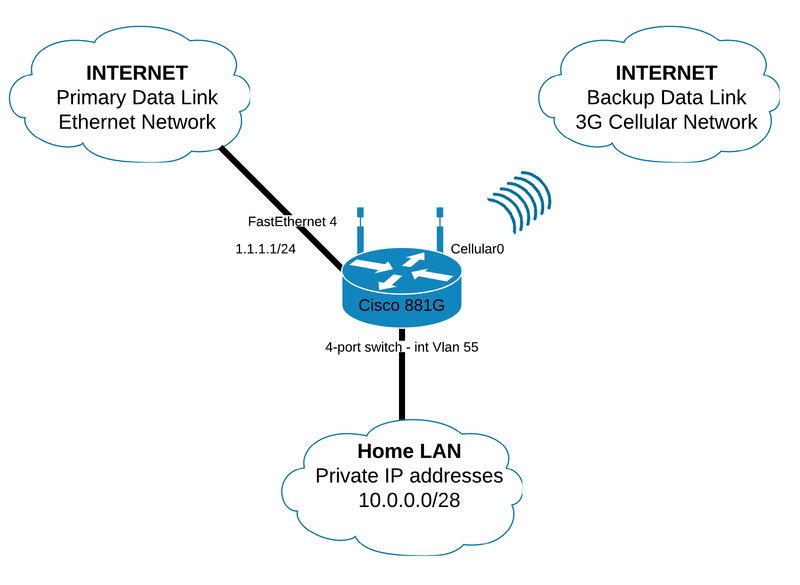 Otherwise when the backup link becomes active it checks the RTT and gets a proper value and it install the primary default route thus resulting in a loop of default routes. Next we need to create a chat script which sends commands to the 3G modem to connect to the remote system. The chat script is called CellScript with a timeout value of 30 seconds. Please note that the script may be different depending on the carrier. Router(config)#chat-script CellScript "" "ATDT*98*1#" TIMEOUT 30 "CONNECT"
The address translation is complete too. In the next section we will implement the dynamic failover mechanism using Cisco IP Service Level Agreements ( SLAs ). The Cisco IOS IP SLA is a powerful tool which can help improve your networks services. It allows you to monitor traffic parameters like round-trip delay, one-way delay, one-way jitter, packet loss, TCP connection time, DNS lookup time and many others. Let’s get to the config line and show how we should implement the SLAs. To review the above config lines: The routers pings 8.8.8.8 with ICMP REQUEST packets having the source address of Fa4 and if an ICMP REPLY packet isn’t received within 150ms the IP SLA operation is considered to have failed. This process is repeated once every 2 seconds. We set this process to start now and occur forever. The track object informs the static route if a state change of the IP SLA occurs. Next we will associate the primary default route with the tracker.